When Paji wanted a nice South Indian breakfast and I did not have any freshly ground batter, I quickly made up this recipe. Much to my delight, the adais turned out even better than I had anticipated. Paji absolutely loved the flavor and especially the crunchy, crispy texture of the cornmeal similar to the fresh ground batter! Flavorful adais take just minutes to prepare. The combination of grains (cornmeal) and legumes/beans (urad and besan) provides abundant protein, vitamins and minerals which makes these adais not only good, but good for you also. Enjoy! Finely chopped onions, green chiles, coriander leaves (cilantro) etc may be added to the batter and made into vegetable adai. Combine the flours, salt, and spices in a mixing bowl. Stir well to mix. Add about 3 cups of fresh water and stir well to form a smooth batter; an immersion or stick blender is great for this task. Set aside for at least 15 minutes to hydrate the flours. Alternately, the batter can be made overnight and stored in the fridge until needed. Heat a cast iron griddle (tava) or skillet rubbed lightly with a bit of oil. When the griddle sizzles if a tiny drop of water is flicked on it, it is ready. You might want to closely monitor and adjust the heat throughout cooking to maintain a hot but not burning griddle. Too hot a griddle will not allow sufficient time to cook the adais; it will also ruin the seasoning of the pan. Make a mini adai to test the griddle and batter; if it cooks to your satisfaction continue with making regular sized adais. If the batter is hard to spread and produces too thick adais, add a little water to thin the batter. Pour about one or two ladles of batter on the griddle and spread quickly into a moderately thin (adai are not paper thin like dosa) circle almost to the edge of the pan. Make a little hole in the middle with the edge of the spatula. Drizzle a few drops of oil in the little hole in the middle and around the edges and cook until top is slightly dry and changes color. Using a thin spatula, loosen the adai and flip over to cook the uncooked side. Adai should be slightly crispy and golden brown when cooked. Remove to a plate and continue making more adais as needed. Serve hot with fresh unsalted butter, Indian brown sugar, pickles, chutneys, jams, etc as desired. Aviyal or Tangy Red Bell Pepper Chutney is a great side for these adais. Or roll up with a favorite filling such as the Potato Curry. Save any extra batter in the fridge; it will last for about a week. This is truly an amazing pie using fresh pumpkin/squash! And very easy to boot; who needs more complications when one is trying to cook a big feast!? Just put all the ingredients in the blender, give a whirl and off into the oven. I make it as the last recipe for the day; the pie bakes as I finish all the clean-up. Then relax and enjoy the evening with an amazing pie. A friend gave me a recipe and the important assignment of making dessert for Thanksgiving dinner. I adapted the recipe to suit what I had on hand. The recipe called for cooked pumpkin; and I had none. So I used fresh butternut squash that I had and it worked! Same with the spices; I only had fresh ginger and whole nutmeg and cloves which I used. This recipe is Gluten, Dairy, and Fat Free! It looks too good to be true but I guess you just have to see - well actually taste :P - for yourself to believe it. I love that it is so guilt-free too ;D --who needs all the extra calories from the crust? If you must have the crust, go ahead and use one - but do try without it at least once; I do not miss it. I used a freshly peeled and cubed butternut squash the first time and it turned out to be very flavorful. I have made several since then and they disappear pretty quickly! Any sweet and flavorful pumpkin/winter squash may be used; but not the humongous jack-o-lantern types as they are typically grown for their size and not flavor. If you like to use cooked or canned pumpkin, use 2 cups. I generally use whole spices as they last longer; so the amounts given for the dry spices are approximate. Once you make your own pie, adjust the spices according to your preference. Also, I used the Indian tapioca pearls (Sago or Sabu dana); they are available in Indian markets as well as most grocery stores. Tapioca starch (or flour) is available in Asian and Latino markets. Rice flour maybe found in most stores. 8 servings, each piece (without the raisin sauce or cream) containing 153 Calories (k cal); 1g Total Fat; 3g Protein; 34g Carbohydrate; 0mg Cholesterol; 264mg Sodium; 3g Fiber. Coat a 9 or 10-inch pie pan with cooking spray or oil. I used a Corning glass-ceramic pie dish and even the middle sections of the pie came out without any stickiness. Set the prepared pie pan on a cookie sheet; the cookie sheet will catch any overflow/spills if any happen. Place the first four ingredients, the tapioca, water, milk, and rice flour in a small bowl for and let them soak for 15 minutes; pour into the blender container and blend well until smooth. Add the next seven ingredients - sugar through vanilla and blend well. Add the winter squash/pumpkin, puree to the blender container along with the baking powder and blend gradually increasing the speed, stopping to scrape the sides as needed to make sure everything is thoroughly blended. This should take about 2 to 3 minutes. Pour the squash/pumpkin puree into the prepared pie pan and bake for 10 minutes. While the pie is still baking, reduce temperature to 350 degrees and bake for a further 50 minutes. The edges should be lightly browned, but not burned and pulling away from the sides of the pan. Remove from the oven and place on a thick towel set over a cooling rack to cool slowly. I find that the slower the pie cools, the less it shrinks or collapses. Chill the pie when it is completely cool until ready to serve. Or serve at room temperature. Serve with warm Raisin Sauce and lightly sweetened whipped topping/Cashew Cream if desired. Here is the recipe for Baked Neyyappam, a favorite of Amma's. 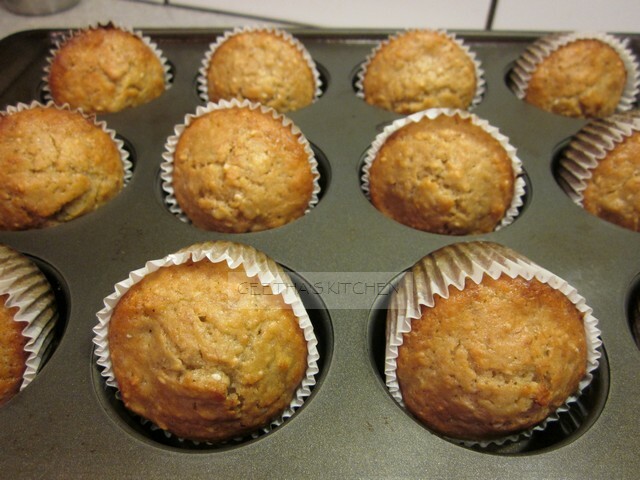 This recipe is dedicated to my mother Jaya because she enjoyed the eggless banana muffins that I made for her. They reminded her of the 'Neyyappams' and she wondered if we could add all the traditional flavors - cardamoms, Indian Jaggery, and coconut. Thus was born the "baked neyyappams". We had fun experimenting and we often added cashews. Traditional appams are cooked just like the Scandinavian abelskiver in a pan of the same name that looks just like the Indian "appa karai" or "paniyaram pan". Amma was amazed that the Scandinavians eat "appams" too :D.
Appams are made for celebrating life - from birth ceremonies of new infants to memorial ceremonies called Shraddham and everything in between. They are also another well-loved offering for festivals and auspicious occasions. Amma loved that the baking process cuts down on preparation time and the amount of ghee used for frying - we could enjoy baked neyyappams more often without worrying about fats and cholesterol. I remember how our grandfather (Amma's father) would recite the old Malayalam proverb every time we had neyyappams -"neyyappam thinnal randundu karyam, vayarum nirakkam, meyyum minukkam" which translates as 'neyyappam accomplishes two things, filling the belly and shining the body", the body-shining part being done with the ghee left on your fingers after eating the said appam - Waste not, want not! Although there is no substitute for the traditionally made neyyappam, these are pretty tasty :-)! Preheat oven to 375 degrees F while you are preparing the batter. Heat the ghee in a small pan and cook the cashews until pale gold; add the coconut and cook stirring until pale gold. Remove from heat and set aside to cool. Combine the flours, ground cardamom seeds, salt, baking powder, and soda in a bowl. Mash the bananas well and stir in the lemon/orange juice. Stir in the sugar/jaggery and the coconut mixture. Gently fold the flour mixture into the banana mixture with small additions of the milk until "just mixed" (do not overdo this part). You should have a thick batter. Spoon the batter into a muffin tin well smeared with ghee and bake for about 20 minutes. Test with a wooden skewer or a knife to see if the muffins are cooked; if the skewer comes out sticky, cook for a few more minutes until they are done. Remove from the oven and cool in the pan for a few minutes before serving. Remove from baking pan to cool completely on a rack before storing in an airtight container.